Lewis Wright in Sport on 13 January, 2017. England’s record goal scorer Kelly Smith has retired from football at the age of 38, having scored 46 goals for the national side and many more for one of her six former clubs Arsenal Ladies. During the course of her career, Kelly Smith became the most iconic player in Arsenal Ladies’ history. In joining America outfit New Jersey in 1999, Smith became the first female professional footballer in Britain, a status that many in this country have had the opportunity to experience since. Smith’s immense record of 46 goals in 117 international appearances is beaten still by the Watford-born star’s almost unprecedented record of 81 goals in just 83 appearances across her two stints with Arsenal. The striker was also key in her latest club’s charge towards winning silverware, as she collected five FA cup winner’s medals at Arsenal, scoring six goals in those five finals. Smith retired from international football in February 2015, having revolutionized the women’s game in this country with her achievements both on and off the pitch, and was awarded an MBE in 2008 for services to football, two years after receiving a first FA Women’s Player of the Year award and just a year after winning the award for a second time. Over the course of her 20 years in an England shirt, Smith played in two World Cups as well as four European Championships, scoring a goal in a harrowing defeat to rivals Germany in the Euro 2009 final. Described as “the best women’s player England has ever produced” by BBC commentator Jonathan Pearce, Smith has left the game in the healthiest state it has ever been, with the FA announcing a seven-figure sponsorship deal back in 2015 that is aimed at enhancing the professionalism of the women’s game in this country. “I think I’ve had a very good career at both international and club level, I’ve travelled the world and, at the age of 38, the body is telling me it needs to stop. 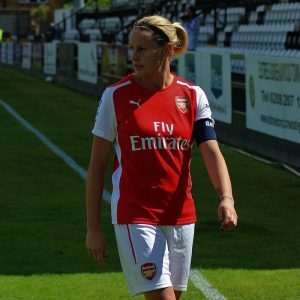 To mark what has been an exceptional career for Smith, top players from around the world are expected to compete in a match at Arsenal Ladies’ home ground in Borehamwood on Sunday 19 February. 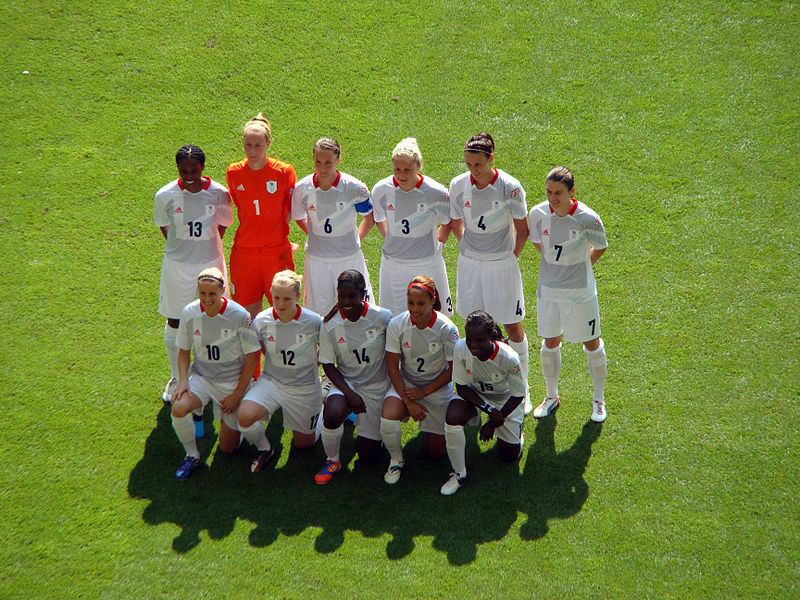 Kelly Smith (bottom left) representing Team GB at the London 2012 Olympic Games.